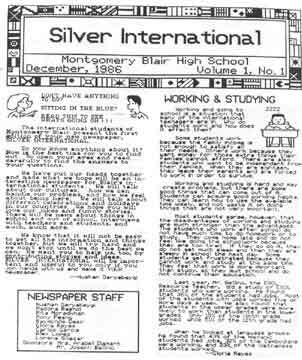 Silver International's first issue was on regular paper and was given only to Blair's 200 ESOL students. Blair's Silver International newspaper, written by international students, is popular in Blair and in other places around the world. Even though it has the name "newspaper," it is not like a real newspaper because there is not a lot of news in it. Its purpose is to let international students write about their concerns and to help all of its readers learn more about our differences. The newspaper doesn't only publish Blair students' writing, but also writing of students inside and outside the United States. Each year, there are a lot of schools that subscribe to the newspaper. Many teachers like the newspaper. Ms. Shilling, who is a level 2 ESOL teacher, said the newspaper is good for her students. "When the students see themselves published, they feel so special, like a writer, because only good writers have their writing published." Ms. Winter who is a level 4 ESOL teacher said, "I like it because it has important stories about problems that international students are having." Many teachers like it so much, that they buy subscriptions to it. Ms. Boss who is a teacher at Central Falls High School in Rhode Island has been subscribing to the newspaper for many years. "My students find it easy to read, because it is at a level which they can understand," said Ms. Boss. Many of the teachers use the newspaper as a tool for helping their students to learn English. Many students who read the newspaper agree with Ms. Boss. It is basic English and is easier to read and understand. Also, students like to read the newspaper because it reminds them of things that they liked to do while they were in ESOL. Leyou Gene who is a former ESOL student said, "The newspaper is so diverse." She said it makes her miss her ESOL classes. The newspaper touches people through the way the international students explain the difficulties that they have. Sampson Geepla who is senior said, "By reading this newspaper, I learn more about international students' problems." And another international student said, "I learn that there are a lot of people just like me."